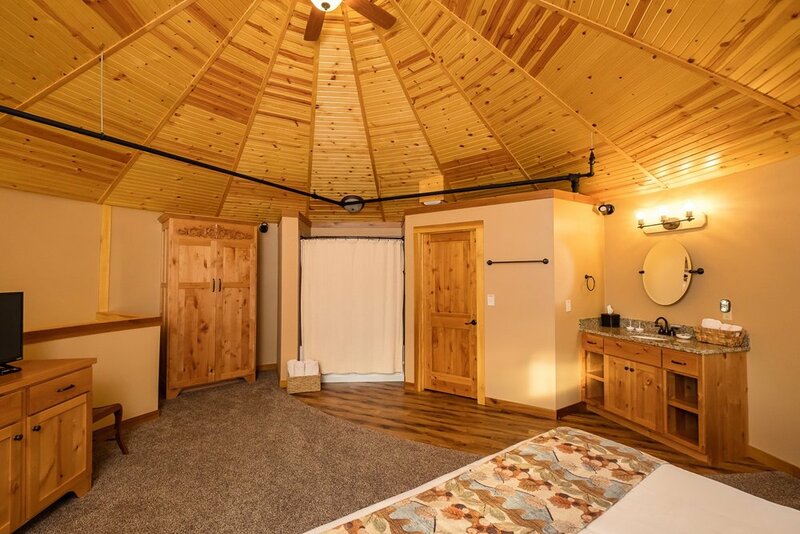 Patoka Lake Winery's two-story luxury Silo Suites are attached to the Winery...and yes, the rooms are ROUND! The open upstairs bedroom contains a king bed, chairs and plenty of cabinet storage. The full bath has a jacuzzi tub/shower unit, and a private water closet, WIFI, flat screen satellite TV. Stay midweek to save, stay a week to save even more (see special deals). All winery lodging guests must be over 21 years of age and will receive a facility tour by appointment, 2 tasting vouchers and reserved parking. Two-story,, luxury Silo Suites are attached to the Winery. Yes, the rooms are round! In an open floorplan on the main floor are a kitchenette, dining area, living area and half bath. Upstairs is the one bedroom featuring a King bed and vaulted ceilings. The upstairs bedroom also has a jacuzzi tub/shower combo, sink and private water closet. The perfect romantic place to stay for your wedding, honeymoon, anniversary, or any reason.